It’s been five full days since I returned from the far North. Every experience changes us, often imperceptibly, sometimes deeply and instantaneously. In fact, we are only change, rippling and blooming anew every moment. Every moment the universe is fresh and evolved. Working at Toolik belongs on the deep and instantaneous spectrum of change. I was driven to a completely new environment, shuttled to an isolated human social experiment, all of us driven by the need to discover. The fascination with the way nature moves, the way it sustains, how the billions of Alaskan beings cope in an environment that is nearly completely uninhabitable for most of the year and bursting with life for the rest. This perfect web. I am a human who comes into that perfection and stomps through it, setting cages made of steel and tricking small animals so I can look at their ear tag numbers and download tracking information from their $450 light logger devices. I am a human that is part of a project that takes these animals from their environment to ship down to Fairbanks for scientific study. I am a human that will receive thousands of dollars from the government to euthanize these animals, cut off their heads, and prepare brain tissue slides so other scientists can measure hormone levels throughout hibernation so we can better understand how these little animals can do it, can survive an Alaskan winter. Why is this a part of who I am? I don’t understand how I can live my life without harming or killing other creatures. I am fascinated by arctic survival, how creatures can make it through a period when there are little to no resources available to them and the climate is wildly inhospitable for months. I chose this consciously, and now I am part of what seems like a wildlife extraction service. We honestly do our best to treat these animals and their environments with respect, for which I am grateful. I still feel shocked, sad, and ashamed, unsure how I can reconcile this new life path I have set upon. There are two main reflections I am left with post-Toolik. One is an unearthing of modern humanity’s place in nature. Humanity’s ability to appreciate nature, heal from nature, be awed and feel insignificant in the face of nature’s hugeness and minute intricacy. Also the destruction, great and small, that humans can wrought. The second is a feeling of satisfaction from working hard, consistently pushing my edge, and of being challenged by the immense loneliness of wilderness. I saw my advisor at the Bun today, Dr. Brian Barnes. I was about to go for a bike ride and wheeled over to stop and chat with him while he was in line. He asked how my time up north was and I said, “Great! It was really hard work but I loved it.” (I’m still completely in the “impress mode” with Brian). He then told me that Victor and his advisor had captured seventy animals for UAF, UA in Anchorage, and Northern Arizona University to study for the winter. I said that was wonderful, but didn’t feel that way, really. He told me he was glad I liked Toolik, because I’d be back again. The way he said “again” insinuated many trips up the haul road in the years to come. I didn’t know what to say in return. 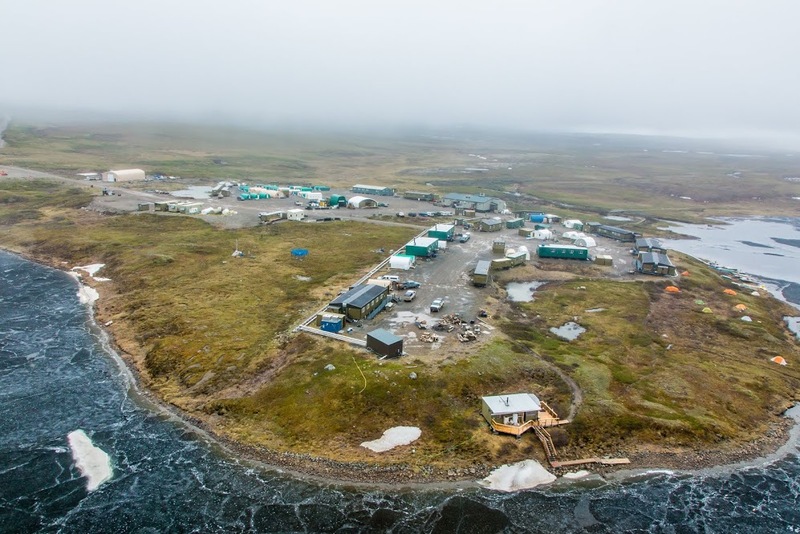 Toolik Field Station image courtesy of http://www.thewilkesbeacon.com.